It is widely acknowledged that corruption by any firm is problematic. 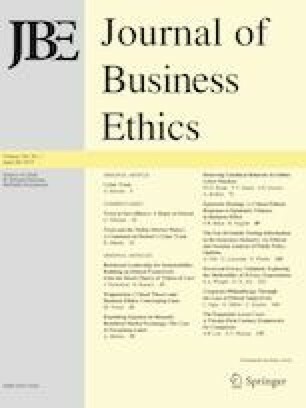 More importantly, its negative effects are compounded when (a) corruption is present in large firms with global reach and (b) corruption ceases to be a single instance but becomes a reoccurring or perpetuating phenomenon over time. Though the magnification of corruption over both time and size of operations creates scale effects that amplify its detrimental consequences, this context remains largely unexamined empirically. Thus, our research question is: What are the factors that contribute to corruption by large global firms? Drawing on institutional theory, we examine the normative pressures that interact to create a vortex of corporate corruption that persisted over several years. We analyze a 9-year longitudinal dataset of 469 unique FT Global 500 companies representing 31 primary industries and 33 countries with over 3700 company year observations. Results help disentangle a complex interaction of firm-level and headquarters country-level factors that drive corruption and impact performance among top global firms. Leyla Orudzheva declares that she has no conflict of interest. Manjula Salimath declares that she has no conflict of interest. Robert Pavur declares that he has no conflict of interest. BBC. (2016). Serious Fraud Office opens Airbus corruption investigation - BBC News. BBC News. Retrieved August 15, 2016 from http://www.bbc.com/news/business-37005459. Dullforce, A.-B. (2015). FT 500 2015 Introduction and methodology. Financial times. https://www.ft.com/content/1fda5794-169f-11e5-b07f-00144feabdc0. Fortune.com. (2015). Fortune global 500 methodology. Fortune.com. Retrieved June 6, 2016 from http://fortune.com/global500/2015/#methodology. Kim, E.-H., & Lyon, T. (2011). when does institutional investor activism increase shareholder value? : The carbon disclosure project. The B.E. Journal of Economic Analysis & Policy, 11(1). https://doi.org/10.2202/1935-1682.2676. The Guardian. (2016). Fifa corruption scandal: US releases three guilty plea transcripts. The Guardian. Retrieved August 16, 21016. https://www.theguardian.com/football/2016/apr/18/fifa-corruption-scandal-us-releases-three-guilty-plea-transcripts. US Commodity Futures Trading Commission. (n.d.). Dodd-Frank Act - CFTC. Retrieved January 24, 2018, http://www.cftc.gov/LawRegulation/DoddFrankAct/index.htm.